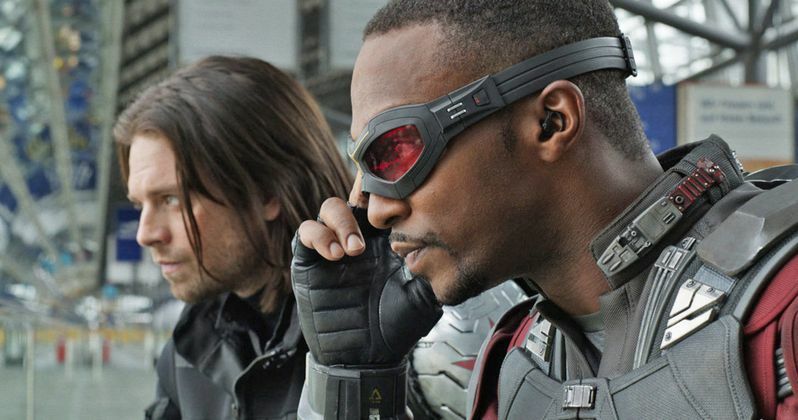 Falcon and Winter Soldier is officially moving forward as a TV show for Disney+. The news was confirmed today during Disney's big shareholder meeting. The company also unveiled the first logo for the upcoming comic book adventure. This is pretty big news since the show has been rumored for so long. Disney boss Bob Iger previously revealed the Loki series starring Tom Hiddleston is currently in development too. The Falcon and Winter Soldier TV series was announced last year as Disney started to ramp up its streaming plans for original content. Disney and Marvel Studios have been dominating the theatrical landscape for over a decade with their MCU franchise, which all culminates later this month in Avengers: Endgame. Now, Disney is moving this powerhouse, and some of its most popular characters to the small screen. The Falcon and Winter Soldier logo looks in line with what we've come to expect from Disney and Marvel. Falcon's name is presented in bold stainless steel, while The Winter Soldier is backed by a red glow that gives it all a very Captain America like feel. It was previously announced they had found a showrunner for the series, but that person has not been announced at this time. It is believed Anthony Mackie and Sebastian Stan will be reprising their roles as their iconic characters who are currently dead in the MCU. Last year's Infinity War saw both characters fall victim to the Decimation at the snap of Thanos. As the MCU moves into Phase 4, there is a lot of mystery surrounding where it will go. However, the small screen looks like it's going to share some stories with familiar characters who may not move forward on the big screen in Phase 4. Marvel Studios boss Kevin Feige has already expressed excitement in bringing the storytelling to Disney+. Feige likes the idea of being able to tell a solid story and not have any time constraints. Additionally, it is believed that the Marvel shows on the streaming platform will all have a generous budget to keep in line with their big screen counterparts. Getting into the streaming platform business is a gamble for Disney, but they're coming out with guns blazing. It isn't clear when the Falcon & Winter Soldier will begin production, but since it has been announced, one can imagine it will happen shortly. Disney+ is trying to get as much original content in the fire as they can to lure over new subscribers to their streaming service. They already had a leg up on the competition with their classic back catalog, the MCU, and Lucasfilm, but now they are taking it to the next level with their Fox properties too. In addition to the Falcon & Winter Soldier show and the Loki show, Disney is developing a Scarlet Witch and Vision series along with the recently announced Hawkeye series. You can check out the Falcon & Winter Soldier logo below, thanks to the Nerdy Basement Twitter account.